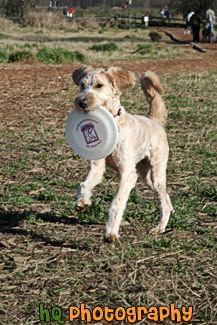 A scenic vertical picture taken of an apricot colored goldendoodle puppy playing with a frisbee. She has the frisbee in her mouth and is bringing it back to her owner. This photo was taken at the Marymoor dog park located in Redmond, Washington.